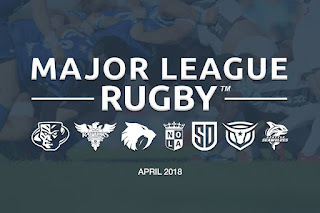 We have reached week two of the inaugural season of Major League Rugby. With the NOLA Gold on a bye this week, let's take a quick look at this week's matches. Boy, were we wrong about the Seawolves. They came out and dominated the San Diego scrum. They will look to continue their all around attack and prove that they should have never been doubted. They will be without a few pieces as Kellen Gordon, Riekert Hattingh, and Jeremy Misailegalu are set to miss out. The Seawolves will look to continue their growth into another Seattle championship side. Glendale got off to a slow start against Austin last week, but don't let that fool you. The Raptors are a dangerous team. They will have to reign in their discipline as they are missing Ben Landry and Connor Cook for the next three weeks due to red card suspensions. The Raptors have a deep roster and will look to bring that depth to Seattle. The Austin Elite gave the Glendale Raptors a good game last week. They were able to get the Raptors to show some cracks in their game. They will need to continue that and cut down on the penalties given away. They were hard done by a missed call on a Glendale try, but the calls don't always go your way. Austin will need to show they can take advantage of their opportunities. Houston was a preseason favorite. They assembled a good team. They played a long preseason schedule. And they got good experience against decent teams. However they were unable to put that together in a loss to NOLA last week. The Sabercats will have to be a little more disciplined and not give up so many penalties. Houston has a good offense, they just need to cut down on the small mistakes. The Legion will look to bounce back from a defeat against Seattle. They were dominated in the scrum and will look to make some fixes against a team that has also had some issues with their scrum. The Legion add a few pieces to their roster with Siaosi Mahoni and Tony Lamborn joining the squad. The Legion backs will be their key to the match. If they can match the Warriors, it should be a good match. The Utah Warriors are heading into their first regular season MLR match as they had week one off. They will look to bring their scrum up to par and will look to break the San Diego defense with their imposing mid field. The Warriors are down a man after losing Josh Whippy to a compound fracture of his leg. Utah will look to show they mean business after being predicted to finish mid-table.